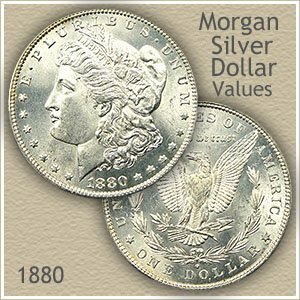 Currently your 1880 Morgan silver dollar value is $18.63 . However this is just a minimum value representing how much a circulated-worn 1880 dollar is worth. With its large silver content as a start and collector demand for the Carson City issue your coin has the potential for much higher value. Of the four mints that produced silver dollars in 1880, those struck at Carson City are scarce today. Add in the huge popularity of these coins and the prices are well above average. Additionally, referring to the image to the right, its "uncirculated" condition stands out as far better than most surviving 1880 Morgan silver dollars. Absence of wear, bright colorful toned luster and lack of contact marks sets this coin apart. As a collectible it is a nice example and the type collectors seek. Judge condition and mintmarks closely. Varying degrees of wear determine condition with values listed on the chart below. Also, mintmarks identify the mint that produced your silver dollar and are valued separately. Both are covered in detail further down the page. Mintmarks do make a difference in value. As collectors assemble sets, most include examples from each of the four mints that produced silver dollars in 1880. Identified by mintmarks located on the reverse side of the coin, these different mints are "S" San Francisco, "O" New Orleans and "CC" Carson City mint. The Philadelphia mint did not place a mintmark on 1880 silver dollars. Largest of US coins, silver dollars when mixed with others are heavy enough to quickly inflict deep marks and cuts onto each other. Unfortunately as part of the minting and storage process these Morgan dollars were placed into canvas bags with 1000 other silver dollars. Easy to imagine the stacking, handling and transporting of bags resulted in a multitude of abrasions. Surviving today without marks from a thousand coins per bag is rare for an 1880 silver dollar. One such rarity was sold by David Lawrence Rare Coin Auctions. Still retaining original bright luster, surfaces with the lightest of minimal bumps and bruises, the coin pictured attracted serious attention. Bidding continued until $402 was necessary for one collector to add a gem condition dollar to their collection. 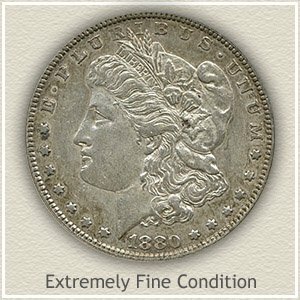 Review again the above grading images, even if your coin is circulated, condition is an important part of overall 1880 Morgan silver dollar value. The degree of wear (hopefully none at all) is a little hard to gauge but is one step that needs attention. 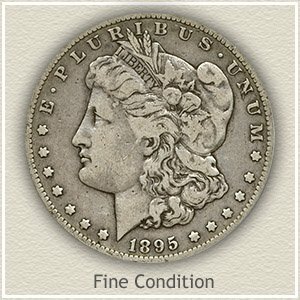 Following the lead of collectors, examine the condition of your 1880 dollar closely. As you compare your coin to the images, a close match of its condition becomes apparent. This process determines the "grade" and using the above chart identifies an accurate value of your 1880 silver dollar. 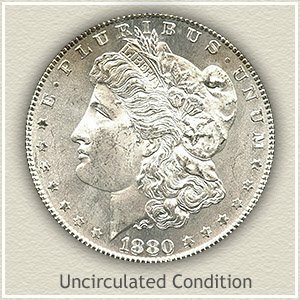 Uncirculated: Highest 1880 Morgan silver dollar value is reserved for "Uncirculated" examples or also known as Mint State. Coins in this "brand new" condition are the highlights of collections. 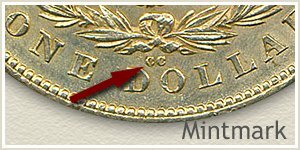 The minting process imparts a delicate frosty luster to the surface of coins. When titled, light on an uncirculated coin reflects in bright bands uninterrupted from rim to rim. Confirm your coin is uncirculated by examining Liberty's cheek and chin area, any wear across these high points shows as a break in luster. Extremely Fine: As silver dollars begin to show slight wear their condition is graded as extremely fine. Noticeable within the hair above Liberty's forehead and behind her neck, flattening is evident. Wear and loss of roundness also shows atop the folds of her cap. Your coin in this condition is still very sharp and crisp. 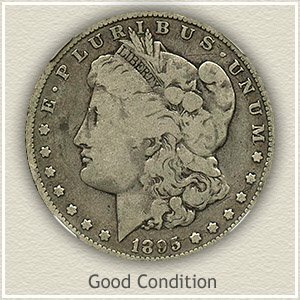 Good: If your 1880 silver dollar has endured extensive wear it is described as "good" condition. Despite a large loss of detail Liberty's portrait is clearly separate of the field. A few lines of hair curls show behind the base of her neck. Although heavily worn some folds to the cap are visible. A once protective rim is now all but gone and close to merging with the lettering. No surprise here, the large size and classic designs insure Silver Dollars are one of the favorites with collectors. Each series is covered in detail, with values listed for all dates and mintmarks, including more on your 1880 Morgan silver dollar value. Compare your coins to images in the sections "How to grade Silver Dollars" and accurately discover how much your old dollars are worth.